I travelled by car to Botswana in May 2016 after a stay in South Africa at Horizon Lodge. Combining the two works really well. Until I worked at In The Saddle, I hadn’t even heard of the Tuli area located in the remote eastern corner of Botswana. 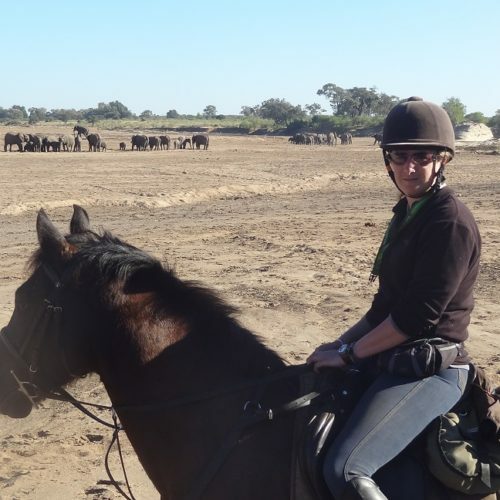 The Tuli Trail is great for anyone who hasn’t done a riding safari before (like me) or for people who have done safaris before in different parts of Botswana. The Tuli Trail explores the banks of the Limpopo River within the Mashatu Reserve. The Mashatu reserve is famous for its large herds of wildlife and I can certainly second that. On our safari we saw some massive family herds of elephants, zebra, loads of giraffe and there were plains game around every corner (bush McDonalds as our guests West and Mpho called them!). It is also famous for its large cats which we saw from a vehicle but not from horses. Previous guests had seen them on horses but on our week we didn’t. For the riding you need to be fit and used to some long canters. You are riding in vast open spaces so this ride isn’t for anyone who isn’t used to riding outdoors and only been used to an arena. You need to ride independently and think for yourself. I couldn’t fault the horses; they all looked really well, knew their job and were great around the game. We were a group of eight and all of us loved the horses we were allocated. I think mention must go to the guides on this safari, all of which have been at Limpopo for many, many years. They spend years qualifying as lead guides and there is not much any of them don’t know about the horses, area and game. A real highlight of this safari. In fact many guests return just to ride with the same guides (although we can request a guide this cannot be guaranteed). The accommodation is in large canvas tents but I found them very comfortable and they have everything you need. I shared my tent with another girl and there was plenty of room for us both. I travelled in May and although the days were hot, it did go very cold at night, so don’t forget your warm pj’s!! Two nights you sleep under the stars at Kjotla an old triple court. I absolutely loved this but it’s not for the faint hearted as you can hear all the wildlife around you and you may even have a monkey throwing things at you from the above trees!!! Overall I think this is a great safari with lots of game, great horses, knowledgeable fun guides and compared to a lot of the other safari’s it’s easy to get to.